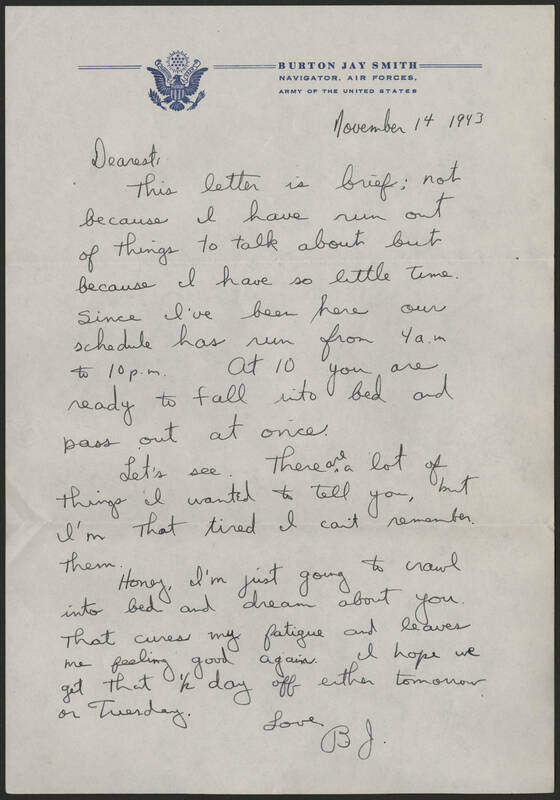 November 14 1943 Dearest, This letter is brief; not because I have run out of things to talk about but because I have so little time. Since I've been here our schedule has run from 4 a.m. to 10 p.m. At 10 you are ready to fall into bed and pass out at once. Let's see. There are a lot of things I wanted to tell you, but I'm that tired I can't remember them. Honey, I'm just going to crawl into bed and dream about you. That cures my fatigue and leaves me feeling good again. I hope we get that 1/2 day off either tomorrow or Tuesday. Love B.J.